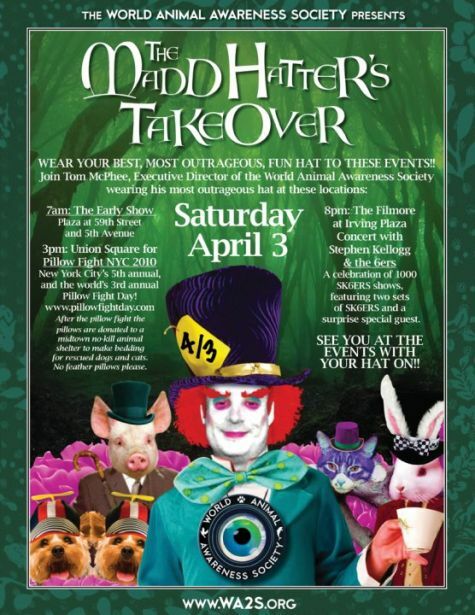 The Maddhatter's Takeover is a full day of events on Saturday, April 3, 2010. Tom McPhee, Executive Director of WA2S.org,The Maddhatter, will join supporters wearing their most outrageous HATs as the WA2S.org takes over animal inspired events in NYC. March 29, 2010 - PRLog -- New York City - On Saturday, April 3, 2010, Tom McPhee as The Maddhatter, representing the World Animal Awareness Society, will embrace two awesome animal inspired events in New York City. At 3 PM the fun begins in Union Square for Pillow Fight New York City 2010, NYCs 5th annual, and the world's 3rd annual Pillow Fight Day! After the pillow fight the pillows are donated to the Humane Society in midtown and Bide A Wee to make bedding for rescued dogs and cats. The evening festivities begin at 8 PM at The Filmore at Irving Plaza for a celebration of 1000 Stephen Kellogg & the 6ers shows, featuring two sets of SK6ERS and a surprise special guest. All of these events are friend/fund-raisers for the World Animal Awareness Society - WA2S.org . Everyone is welcome to participate, but we are insisting that all party guests appear wearing their best, most outrageous, fun-est Hat to all events! About Tom McPhee - Tom McPhee founded the World Animal Awareness Society. Tom has been an award winning producer and director of film, tv, multi-language interactive media, as well as a specialty film/media distributor. Tom McPhee is the owner of 2 media companies, Cave Studio & Man Smiling Moving Pictures (http://www.mansmilingmovingpictures.com). He went down to New Orleans after Hurricane Katrina to help provide relief to those affected. While in NOLA Tom discovered an entire world he had no idea existed and most people never pay attention to: the world of animal rescue which led to Producing/Directing the award-winning documentary An American Opera. Over the last 4 years, buoyed by An American Opera: The Greatest Pet Rescue Ever! Tom has organically navigated toward developing filmed content with a focus on animal/pet-centric themes. Tom served as producer and host/character on two animal-centric TV shows in 2009 for Canada’s The Pet Network. About the World Animal Awareness Society - WA2S.org - World Animal Awareness Society is a non-profit organization incorporated in the state of Michigan. The mission of the World Animal Awareness Society is to focus a lens on a wide range of human-animal interactions in order to have a filmed record of our behavior in expectation that it will lead to greater human awareness. Visit the World Animal Awareness Society online to explore http://www.WA2S.org. World Animal Awareness Society (WA2S.Org), a non-profit, incorporated in the state of Michigan for the purpose of filming contemporary human-animal interactions at the point of intersection, to be shared with the world. American Strays Canine Survey Coming to San Antonio in May - Volunteers Needed Immediately! American Strays The Series - Tracking Dogs In Detroit Starring Familiar Animal Cops Debuts April 2!